Choosing the best part about a piece of cake is challenging. It’s all good! It’s cake! But if I were pressed, I could identify one particularly good bit about every kind of cake. I do love the soft, moist crumbs that cling to the frosting on a layer cake, or custardy, clafoutis-like pockets that form around bits of fruit in a simple strawberry yogurt cake. 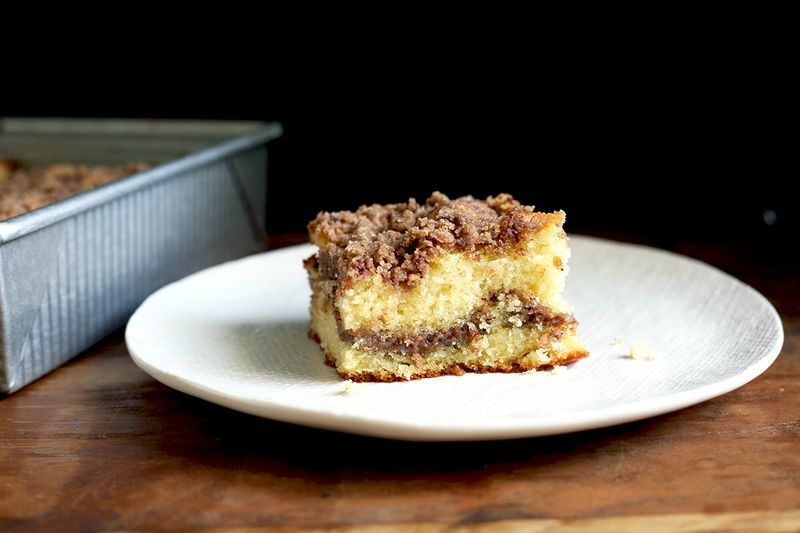 And in a coffee cake, it’s all about the streusel. I am no mathematician. But it has always seemed to me that doubling the streusel in your standard coffee cake would double the deliciousness. I can now report back that this is true. Today’s coffee cake batter is a pretty standard one, although I like to use Greek yogurt as the dairy (although sour cream is a fine option). Yogurt keeps it moist and not overly rich, letting the streusel take center stage as the real star.